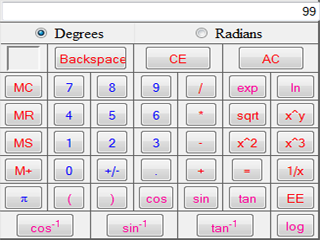 Scientific Calculator is just like the hand-held one, but it runs directly in your browser. A scientific calculator is a type of electronic calculator designed to calculate problems in science (especially physics), engineering, and mathematics. They have almost completely replaced slide rules in almost all traditional applications, and are widely used in both education and professional settings. Scientific calculators are used widely in any situation where quick access to certain mathematical functions is needed, especially those such as trigonometric functions that were once traditionally looked up in tables; they are also used in situations requiring back-of-the-envelope calculations of very large numbers, as in some aspects of astronomy, physics, and chemistry. They are very often required for math classes from the junior high school level through college, and are generally either permitted or required on many standardized tests covering math and science subjects; as a result, many are sold into educational markets to cover this demand, and some high-end models include features making it easier to translate the problem on a textbook page into calculator input, from allowing explicit operator precedence using parentheses to providing a method for the user to enter an entire problem in as it is written on the page using simple formatting tools.